FRACTIONS: This Go Spaceman! 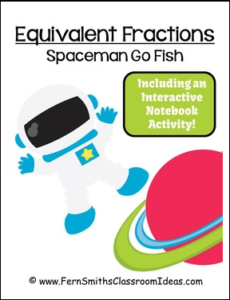 Go Fish Fraction Card Game focuses on Equivalent Fractions! Fraction and Money Identification Signs and Books for Your Classroom! 364 Pages Total! Easter Fractions Concentration, Go Fish and Old Maid Center Games for Common Core ~ Part of a Whole, Three Games in One! Easter Fractions Concentration, Go Fish and Old Maid Center Games for Common Core ~ Part of a Group – Three Games in One! Beach Themed Fractions for Common Core 3.G.A.2 Concentration, Go Fish and Old Maid – Three Games in One! Keywords: FRACTION, FRACTIONS, FREE DOWNLOADS, FREE DOWNLOAD, FREE, FREEBIE, Spaceman, Space, Outer Space, Fractions, Center Game, Fraction Center Game, Free, Freebie, Princess Theme, Math Printables, Seatwork, Math Daily Five, Math Daily Three, Math Stations, Small Group Remediation, Homework, Math Daily 5, Math Daily 3, Smith’s Classroom Ideas.